(Click to enter the workshop if you just can't wait!) George Hart has been turning math into art since he was a boy. 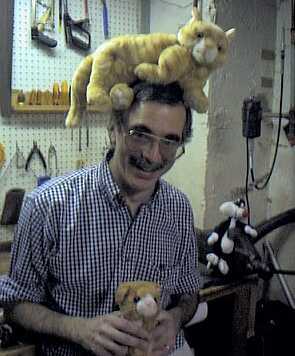 Come along with Emily and the Math Cats on our visit to his workshop! How did you first get interested in geometric sculpture? "I've always liked sculpture and I've always liked geometry. I can't remember not making things, no matter how young I was. I remember being in elementary school and making giant sculptures glued together out of thousands of toothpicks many feet across. But mostly paper. In college, I made lots of original geometric things. I was a math major as an undergraduate at MIT. I did a lot of computer art as well. But I always enjoyed making things. I've always preferred real three-dimensional things, but there were times when I didn't have a studio, and the computer lets you design things and see what they look like; it gives you a sense of creating a 3D form." George started with toothpicks and paper as a boy, but since then he has made sculptures out of all kinds of materials. Can you guess what materials he has used? Pass your mouse over the magic chalkboard to find out! Come on into George's workshop! © copyright 2003 - by Wendy Petti of Math Cats. All Rights Reserved.